We all know how great it feels to start planning something early. But let’s be honest — most of us are no strangers to pulling something together right at the last minute. 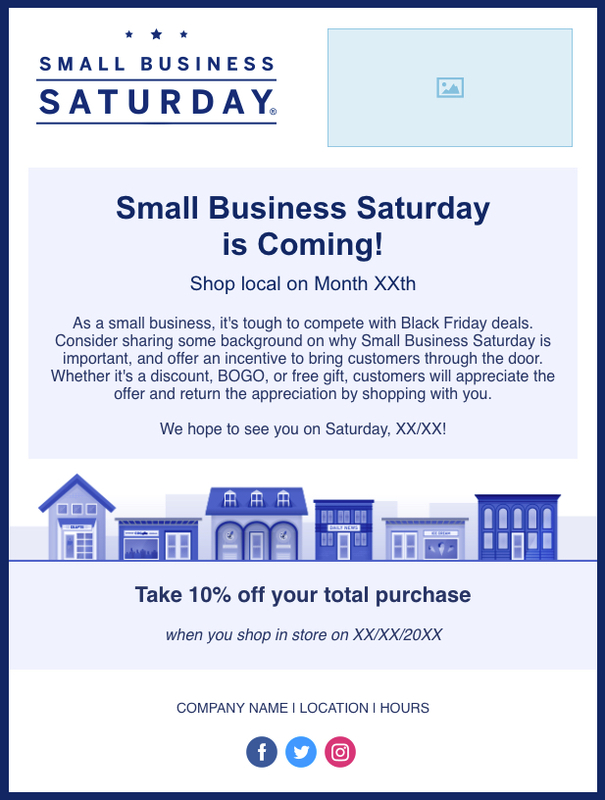 Small Business Saturday is November 24, 2018. But don’t worry — even if you haven’t started planning anything just yet, you still have time to create an exciting offer to draw customers to your business and drive end-of-year sales. In 2017, U.S. consumers spent roughly $12 billion at independent retailers and restaurants on Small Business Saturday. Combine that with all of the shopping that takes place on days like Black Friday and Cyber Monday, and it shouldn’t be a surprise that there will be a lot of competition around this holiday shopping weekend. That’s why it’s so important to have a great offer to help your business stand out from the crowd. Start thinking about your audience and what would appeal to them. What is your store known for? Has anything worked particularly well in the past? No matter what you decide, be sure that it’s something that your business can realistically deliver on. No matter how great your offer is, if no one knows about it, you won’t get the results you’re looking for. A strong promotion strategy can be broken down into three main categories: in-store, email, and social media. 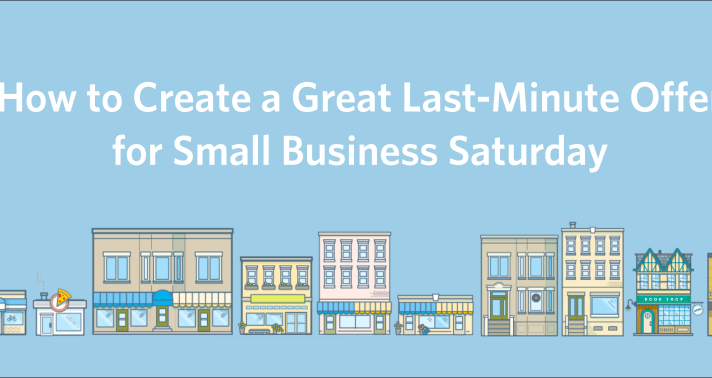 In-store: Leading up to the big day, make sure to mention your Small Business Saturday offer to customers coming into your store. You can also create festive signs to decorate your store or print flyers with all the details. Email: Let your whole contact list in on the offer as well. You can start with an announcement email as soon as you have your offer solidified. Then, follow up with a reminder about a week beforehand and a last-chance email a day or two before the offer expires. Consider creating and scheduling your emails when you’re free, so you don’t have to worry about sending anything right before the big day. Social Media: Don’t forget about your fans and followers on social media. Similar to your email strategy, it’s best to post at least once announcing your offer and then to remind your audience right before the big day. Encourage your fans to share the offer with their own friends to extend your reach. Now that the word’s out, make sure you’re stocked and staffed for success. Think about your staff and what their strengths are, then assign tasks to each member to cut out any confusion when your store is filled with eager shoppers. If you have a master gift wrapper, you can delegate that task to them, while other members of your team can be assigned to helping customers or handling the register. If you’re holding down the fort by yourself, make yourself a quick To-Do list so you can stay on track even when things are hectic. You should also print out an email sign-up list ahead of time and encourage shoppers to sign up to stay in touch throughout the rest of the holiday season and into the New Year. Lastly, don’t forget to snap a few photos to capture the excitement in your store. As exhausting as the day might be, don’t overlook the importance of follow-up in the week after Small Business Saturday. A small thank you can go a long way, and it will only take a few minutes to create. Depending on how many photos you took, you could share an album on Facebook, or simply pick the best one to share with your fans. You can keep your text simple — try something like Thanks to everyone who stopped by to #ShopSmall this Saturday. We appreciate your support and hope to have you back again soon! Next, add your new email subscribers to your list and send out a quick email. In any follow-up message you send, your goal should be to remind your customers of their great experience with you and entice them to visit again soon. Include an image to make the thank you more personal and include an offer to bring people back into your store before the end of the year. Check out 28 Ideas for Your Holiday Email Marketing.